On and off the bike functionality. Street-worthy motorcycle and four-season hiking boot. Gore-tex, Guaranteed to keep you dry. Single boa® lacing system with open lace guides that shed debris. Traction pattern designed for wide range of conditions. Engineered heel to toe full width lasting board provides support. Reinforced rigid toe and heel. Full D3O® protection over ankles and in tongue. Reinforced scratch rubber in high wear areas. Overall Klim did a great job with the GTX boot, light, comfortable, with adequate protection for the commute or weekend tour. 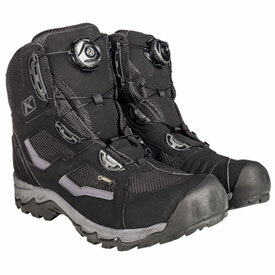 Unlike most Klim gear, this is NOT a trail/ADV boot, it was designed for the less agressive rides. Sole is amazingly quiet and flexible while walking which is easy to do. Fitment seems to run on the wide side in the upper boot while the toe box is standard size. The Boa lacing system is proven in cycling shoes and hiking boots and makes itself right at home in the GTX. With a pop and pull of the tensioner knob the boots are easily removed. If there is one aspect to pick on, it is the tongue on the left boot is a little stiffer compared to the right. This review is only after two weeks/300 miles of commuting.